Frank Thomas autographed Rawlings Official League baseball. This is the Frank that played on the original 1962 NY Mets team. All autographs are 100% guaranteed and come with a certificate of authenticity from www.RKSportsPromotions.com. Ron Swoboda autographed Rawlings Official League baseball. All autographs are 100% guaranteed and come with a certificate of authenticity from www.RKSportsPromotions.com. Dennis 'Oil Can' Boyd autographed Rawlings Official League baseball. All autographs are 100% guaranteed and come with a certificate of authenticity from www.RKSportsPromotions.com. Darrell Evans autographed Rawlings Official League baseball. All autographs are 100% guaranteed and come with a certificate of authenticity from www.RKSportsPromotions.com. Jim McAndrew autographed Rawlings Official League baseball. All autographs are 100% guaranteed and come with a certificate of authenticity from www.RKSportsPromotions.com. Bill Madlock autographed Rawlings Official League baseball. All autographs are 100% guaranteed and come with a certificate of authenticity from www.RKSportsPromotions.com. Mike Easler autographed Rawlings Official League baseball. All autographs are 100% guaranteed and come with a certificate of authenticity from www.RKSportsPromotions.com. 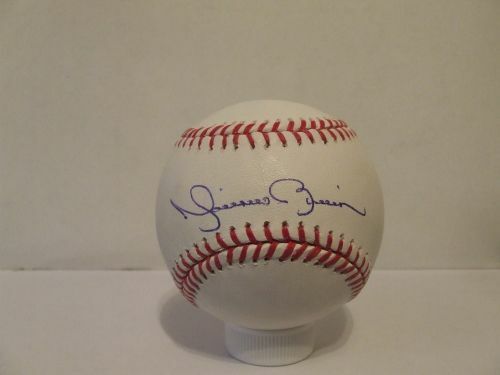 1999 NY Mets Team autographed Rawlings Official National League baseball. The 26 signatures include: Bobby Valentine, Pat Mahomes, Al Leiter, Benny Agbayani, Armando Benitez, Octavio Dotel, Turk Wendell, John Franco, Dennis Cook, Rick Reed, Orel Hershiser, Masato Yoshii, Robin Ventura, Roger Cedeno, Chuck McElroy, Bobby Bonilla, Mookie Wilson, Al Jackson, Dave Wallace, Edgardo Alfonso, Bruce Benedict, Cookie Rojas, Matt Franco, Billy Taylor, Rey Ordonez & Luis Lopez. Cal Ripken Jr. autographed Rawlings Official American League baseball. All autographs are 100% guaranteed and this item comes with a certificate of authenticity from JSA. Dave Magadan autographed Rawlings Official National League baseball. All autographs are 100% guaranteed and this item comes with a certificate of authenticity from JSA.